What are the main population problems? One of the most fundamental issues of our time is population. It ties into nearly every other problem we have on a global level, and, as result, directly feeds these other problems. To go step by step through this, think about various pairs of issues we have globally right now. Race wars. I dont know of anyone who is not at least a little bit nationalistic when it comes to questions on race. What do I mean by this? Take no. 1 for example – the U.S of A. Serious bouts of nationalistic fervour run deep with them. They are no.1 in most things, and they want to stay there. But one of the problems they face is that the old system, run by white people, principally for white people is struggling with the influx of foreigners, and that is where a lot of the population growth in the US is now centered. 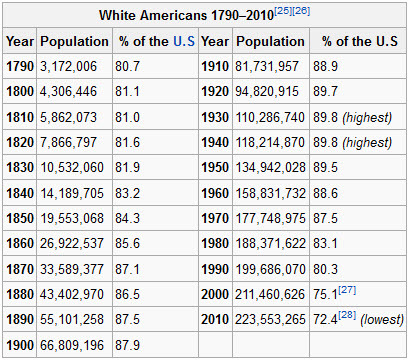 There is a sharp drop in the number of White Americans. But – the system is still predominantly white. Its traditional base however is dropping. Whether you like multiculturalism or not, this is a problem. And this is not from an idealistic view, this is purely from a governance view. Firstly – how does this tie into the population problem? Employment driven population shift is, to some extent, fairly unreliant on the actual country – some of the shift is heading from traditional first world countries to 3rd world countries. For example, De Beers, the diamond company, is shifting operations from London to Botswana (small case in point), but, with much of the remaining mineral and resource wealth now in poorer regions of the world, there is a small shift for resource companies to these places. Also, in IT, with many of the developed world’s infrastructure being at a mature stage, or having only incremental upgrades, there is more work to be had in developing countries. I’ve spent a fair part of my career traipsing round the dodgier corners of the globe – hey, the pay was better. Employment driven population shifts are therefore present, but sort of well distributed, and usually involve people with a reasonable degree of education. Opportunity driven population shift. This is the big one. It’s when people from poorer countries see what the opportunities are like in the wealthier parts of the world and they want a piece of the cake. Simply put, the opportunities are better in pretty cities. Even if you are just a taxi driver. But, and as I will provide abundant evidence of, these people have poorer degrees of firstly education, are less likely to assimilate, and to some extent, they import a raft of problems that were present in their country of origin. And often, they tend to have large families. Did that one surprise you a bit? With the exception of the UAE, these countries are all rated towards the bottom of the Human Development Index (http://hdr.undp.org/en/media/HDR_2011_EN_Complete.pdf). Also, there is zero opportunity driven population shift into these countries, they are basically all squirting out kids as hard as they can. At the other end of the spectrum however is a different picture. Some of the worlds most developed countries are shrinking. Japan: -0.11% population growth. Net migration there is next to zero – Japan doesn’t let too many foreigners in. They let one of them out though – She’s my wife. You would be hard pressed to find any educated person today that doesn’t think there is a problem with the population of the world. Mitigating this slightly is that they are from poorer regions, and therefore use a lot less resources, but on the other hand, these regions are steadily being targeted by corporations and countries looking for their next growth opportunity, so over time, expect them to start using up more and more of the remaining resources. But – back to the problem here – too many people. Even with mitigating factors like low resource usage, populations growing at 2,3,4% per year pose a total arseache of a problem, now, and especially in the future. The growth in employment could NEVER keep pace with this. Ever, not in a million years. So where we have large population growth, we have the additional problems of more and more people competing for resources, crime and a lack of the ability to adequately police this. And these are the people who are jumping on boats and sailing our way. As I said – population growth is massive, the flow is from poor to rich, we are arguably 2-3 times over the carrying capacity of the planet (I will argue this separately), and we dont seem to be doing much about it. The solutions to the problems thus far are not working, and they will continue to not work. We need new solutions, and to find leadership that will help solve problems, not the current approach of sticking band-aids on broken bones.